Herps (shorthand for reptiles and amphibians) are my main interest and primary research group. My ARC DECRA, started in January 2018, aims to identify community changes in the herpetological fossil record of Queensland in order to track evolutionary responses to environmental variation. 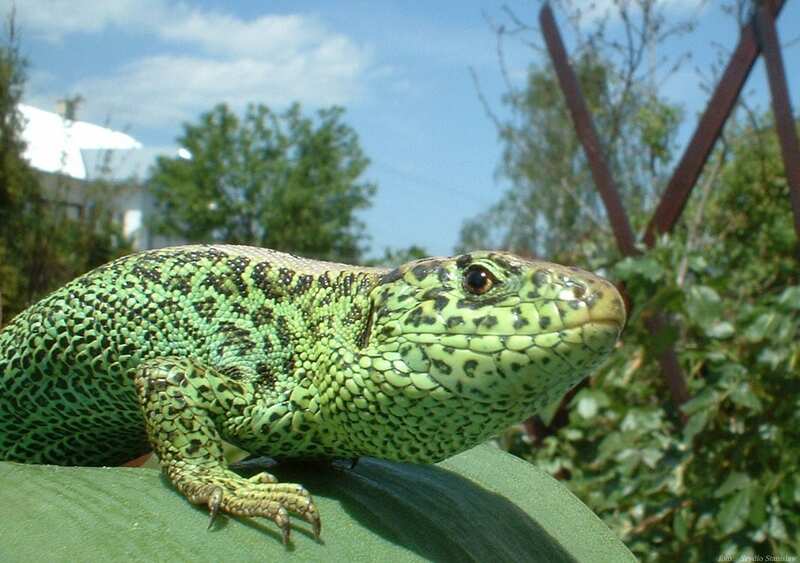 Lizards and frogs are ideal for this approach since they 1) are present across multiple sites of varying ages and paleoclimates, 2) are taxonomically and morphologically diverse, and 3) already exhibit clear effects of global warming. They also responds differently to aridification – while many reptiles thrive in hot dry conditions, amphibians, being dependent on water for reproduction, tend to suffer. My project uses a combination of independent, yet complementary approaches in vertebrate paleontology, animal systematics, and evolutionary biology to reconstruct these ancient events, including X-ray computed tomography (CT), geometric morphometrics, and computational modelling. 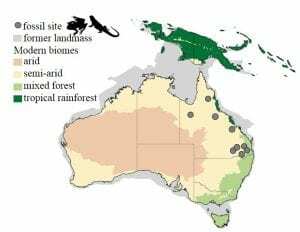 Many large meat-eating marsupials roamed Australia over the past millions of years, but the Tasmanian tiger, or thylacine, was the only one to survive into modern times. 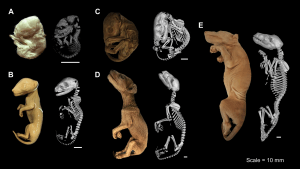 Together with Andrew Pask’s group at University of Melbourne, we are using cutting-edge techniques to reconstruct the life, growth and death of this recently extinct predator, including 3D digital imaging and ancient genome assembly. These methods provide new insights into the thylacine’s extraordinary position among mammals, such as its uncanny resemblance to wolves and dingos, its poor genetic health prior to the arrival of humans, and its relationship to other marsupials like the Tasmanian devil and numbat. 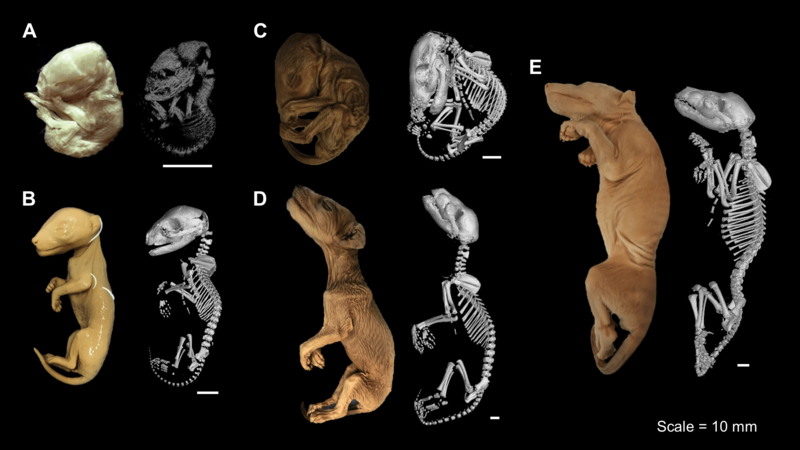 Our previous work established the marsupial thylacine as a model of phenotypic convergence with eutherian canids, despite the two groups being separated since the early to middle Jurassic, some 160-180 million years ago. We later determined, by reconstructing skeletal development of the thylacine using detailed bone measurements from CT scans of all known pouch young specimens in the world, that thylacines also grew, and likely moved, similar to a large cursorial (running) predator. Currently we are trying to identify exactly when and where thylacines diverged from their conserved marsupial development to take on the proportions of a eutherian canid, particular in features of the skull. Our results have been featured widely in both popular and scientific press, showing that the public’s interest in this unique marsupial is still very much alive. My PhD focused on lacertid lizards, and in a lot of ways they are still my first love. The family Lacertidae contains over 300 species of small, mainly terrestrial lizards, ranging from the Arctic Circle to the Cape of Africa. Although they may look unspectacular, lacertids are a fantastic system for evolutionary biology, since they are old, widespread, and inhabit dramatically diverse ecosystems throughout the Old World. Despite those features, they have failed to radiate into the multitude of forms as seen in equally widespread and ancient lizard groups like geckos or chameleons. 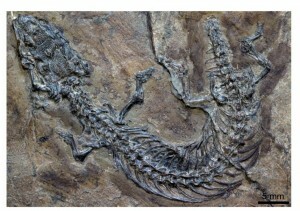 Molecular work over the past decades has consistently recovered lacertids as the sister-group to Amphisbaenia, a bizarre clade of limbless, head-first burrowing lizards. Together with Johannes Müller and others, we provided the first morphological evidence for a lacertid-amphisbaenian relationship in the form of the Eocene lizard Cryptolacerta hassiaca, which we published in Nature in 2011. With their worm-like bodies and powerful burrowing heads, amphisbaenians have long been a mystery to taxonomists and evolutionary biologists alike. 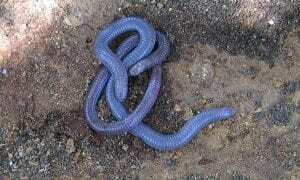 Over the past century, they have been aligned with everything from snakes to various lizard clades, while their in-group relationship remain obscure. This is largely due to the vast amounts of homoplasies both within and between amphisbaenians and other limbless squamates, which tend to converge on similar head and body shapes under the pressures of a burrowing lifestyle. My DFG-funded postdoc at the Museum für Naturkunde Berlin sought to tease apart these factors to identify the timing and sequence of events leading to fossorality and limb loss from a terrestrial limbed ancestor. 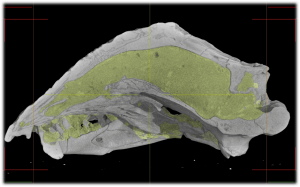 The fossil record is critical to reconstructing this transformation, which we demonstrated using CT scans of the Eocene amphisbaenian Spathorhynchus fossorium from the Green River Formation, USA. By tracking anatomical changes across the amphisbaenian phylogeny, we confirmed several instances of parallel evolution and reversals of supposedly ‘unique’ traits associated with fossoriality, suggesting a far more complex character history than previously thought. I am also interested in the development and morphology of living amphisbaenians, particular regarding constraints on phenotypic evolution (e.g., the West African Coast worm lizard Cynisca leucura, the Caribbean radiation) and geographic distributions (the Florida worm lizard and Rhineuridae).